When I started to collect hyacinth vases, flea markets were the biggest source. Brocante and antique fairs were soon to follow. At first that took mainly place in Holland. It took some years before I found out that other countries had their own specific vases mostly very different from the ones I had from Holland, so I also went to flea markets, collectors fairs, antique shops etc. in countries such as Belgium, France, Britain and Germany. Scandinavia and North America also have their own typical vases. However, bulb vases sometimes show up unexpected in other countries. I found a nice footed French hyacinth vase on an antique fair close to Milan, Italy and even in Japan I came across a nice British hyacinth vase in an antique shop. Fellow collectors are also an important source too. By exchanging or buying from fellow collectors the collection can be increased as well. I exchange, sell and buy (also collections of) vases with the goal of improving and enlarging my own collection. In this way, I have acquired several hundreds of spare ones varying from the very simple ones to quite rare, exclusive vases. In Holland exists since 1998 a club of collectors of bulb vases: De Bloembollenglazenclub. 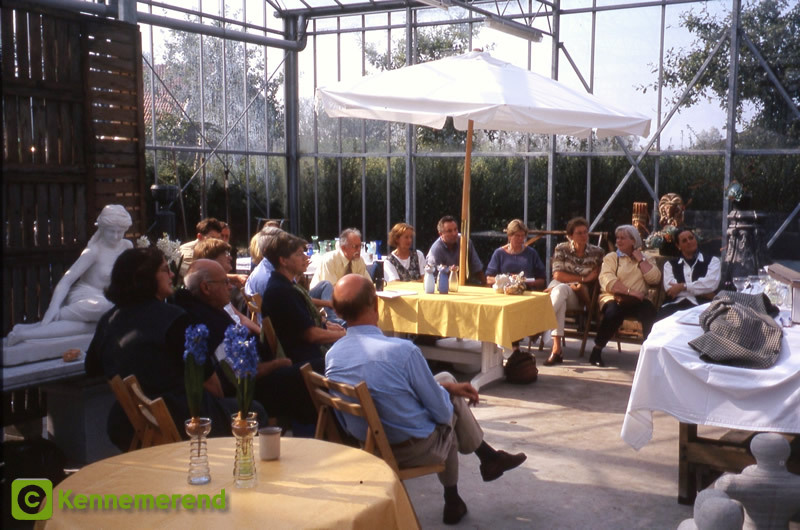 The members (for a part outside Holland) meet two times per year, to listen to lectures and discuss about the subject. Exchanging vases is also one of the activities. More and more, the internet becomes an important source. Buying on auction sites like eBay and the many local auction sites in different countries, is an easy way (just sitting at the computer) to add interesting examples. However, walking around on a flea market or collectors' fair and spotting an interesting vase there, is so much more fun! Prices vary from € 1,- for very simple, mass produced vases, to sometimes more than € 500,- for the very rare, old ones. Of course one always hopes to find one of the last category and pay a low price in the first category, but that rarely happens! Starting a bulb vase collection does not have to be expensive. Many cheap, but interesting vases in beautiful colours can be achieved. It becomes expensive when the targets become more ambitious! Also bulb vases are still manufactured. Several European companies produce them or organise production (often in east European or far eastern countries). The new vases can usually be bought for a few Euros. For the beginner, perhaps a warning is not out of place. Beware of vases that are offered as hyacinth vases but are no hyacinth vases at all. All beginners face that problem. Dealers like to call vases hyacinth vases as they are generally sold for higher prices than 'normal' vases This site can, I hope, help you in this respect; especially the chapter about the use and shape of hyacinth vases. The 'Bloembollenglazenclub' is established in Hillegom, Holland in 1998. Of about 80 members, 50 meet regularly to discuss bulb vases.